Part 1 Culture and technology: The meaning of culture; Representations of technology; Narratives of technology and culture. Part 2 Digital information culture: Textuality; Authenticity; Knowledge; Power; Identity; Memory. Digital Information Culture is an introduction to the cultural, social and political impact of digital information and digital resources. The book is organised around themes, rather than theories and is arranged into three sections: culture, society and the individual. Each explores key elements of the social, cultural and political impact of digital information. The culture section outlines the origins of cyber culture in fifties pulp-fiction through to the modern day. It explores the issues of information overload, the threat of a digital dark age, and the criminal underbelly of digital culture. Section two, society, explores the economic and social impact of digital information, outlining key theories of the Information Age. Section three explores the impact of digital information and digital resources on the individual, exploring the changing nature of identity in a digital world. 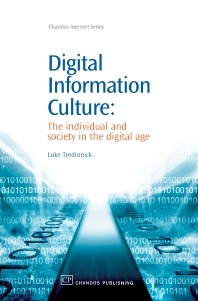 Luke Tredinnick is a Senior Lecturer in Information Management at London Metropolitan University and Course Director for the MSc on Digital Information Management. He teaches on a wide range of topics around the digital information area, including digital libraries, intranets and extranets, knowledge applications and technologies, cyberculture, and the social, political and theoretical aspects of digital information.